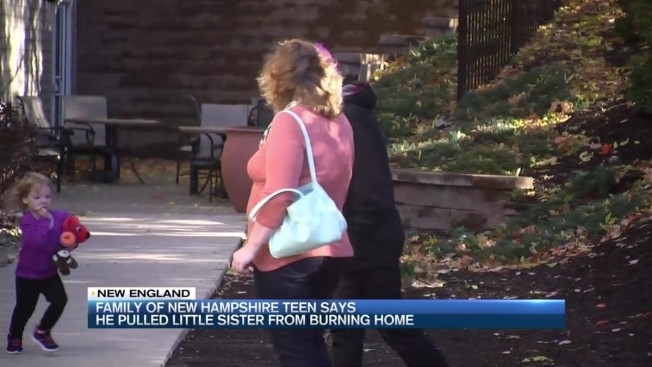 A New Hampshire mom is calling her teenage son a hero after he rushed into their burning home in Epping to save his little sister. Brandon Hutchins, 16, tells necn he was in his room on the second floor when he saw flames out his window. He alerted his family, but when he got outside and realized his 3-year-old sister wasn't there, he jumped into action. Brandon says he fought through white thick smoke and intense heat as he ran bacj into his burning Epping home to find Melodi. "It felt like there was a fire inside me because it was really hot," Hutchins told necn Monday. "I could not breathe." He says the 3-year-old knows had no idea what was happening as fire ripped through the walls of their home. "I think she was watching Dora," Hutchins explained. He tore Melodi away from her favorite cartoon and got her outside just minutes before her room went up in flames. "He did it without thought and he went right in the house without even thinking, he wasn't even afraid," said Brandon's mother, Julia Hutchins. "I'm just so proud of his actions." It was the bravery of a big brother who can't wait to see his little sister grow up. "I'm just really glad I saved her because I can see who she can be when she gets older," Brandon Hutchins said. The Hutchins family is staying a nearby hotel while they make plans to rebuild. Julia Hutchins wants to extend a heartfelt thank you for the outpouring of support from her community. Fire officials say the cause of the Oct. 26 fire is still undetermined.